“Nuts” such as almonds, hazelnuts, cashew nuts, walnuts and pistachios, should actually be termed “dried fruits” as they are seeds removed from the fruit. They should be consumed as often as possible, because they contain essential fats that are so beneficial to our health. 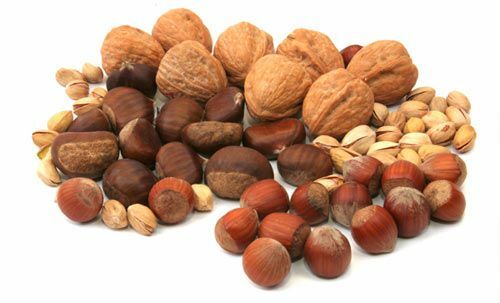 It’s better to buy nuts in their shell, especially walnuts, since the ones that are sold shelled, have often started to go bad already. The best way to preserve nuts is to keep them in their shells, in the refrigerator. To bring out all their flavour, toast them in the oven for 10 minutes at 175ºC/350°F, before serving them, or better still, try them out in the recipe I’m proposing here. Originally published in the Journal de Montréal on July 7, 2007.